Italians seem to love valve equipment. As a nation they produce a broad array of stylish glass-powered electronics; it must be something to do with the romance that valves bring out in music! 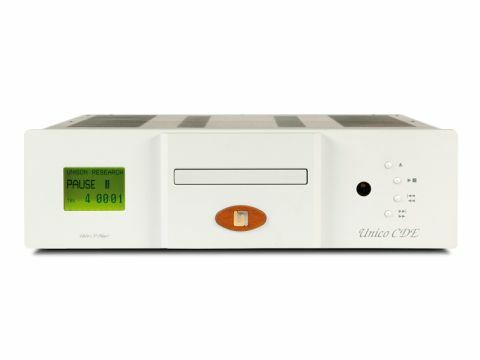 Unison Research makes a number of ampliﬁers and three CD players, of which the Unico CDE Twin is the top dog. In fact, it's slightly higher than that because it's the upgraded DAC-OP2 version of the Unico CDE. This is an optional upgrade to the standard CDE that costs £150 if you ﬁt it yourself, but adds £175 to the price of the normal player. It replaces a single Crystal DAC with a pair of Wolfson convertors, albeit leaving the Crystal in place (which allows you to switch between the two via the front panel), a unique if not entirely essential feature. The CDE runs a TEAC transport through a Crystal digital interface to the Wolfson 24-bit/192kHz DACs, which run in dual-differential mode. The glass can be found in the output stage, which has four ECC83 double triodes in a parallel cathode-follower arrangement. There is little chance, therefore, of running this thing in standby with less than a Watt. On/off switching is placed on the right hand side of the case which seems perverse but keeps the bead-blasted facia minimal and with only four buttons, it's hardly busy. What gives it a bit of sparkle is the large backlit LCD display, which can be switched off if required.